FeastHome – A wall built-in kitchen cabinet or also known as an upper kitchen cabinet is one of the most used types of kitchen cabinets. It is because an upper kitchen cabinet is able to save some spaces in a kitchen area. But for some reasons, there are also some people who do not use a wall built-in kitchen cabinet. If you want to do the same, you can try these inspirations of a modern kitchen without upper kitchen cabinets. 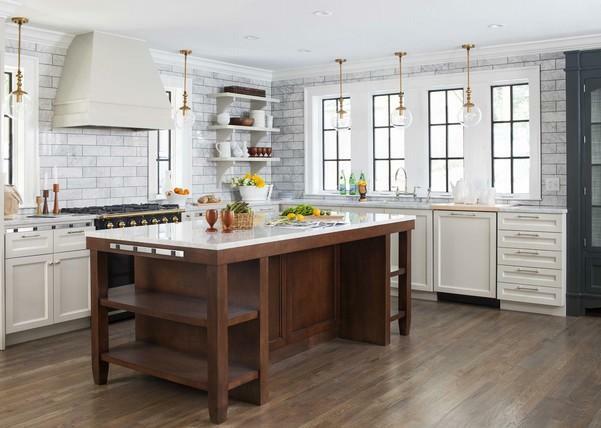 The traditional look in this kitchen comes from the use of the wooden kitchen table, wooden floor, and white brick kitchen walls. Those elements make the traditional style in this kitchen area looks strong. The white color from the bottom kitchen cabinets and brick walls blend prettily with the wood material, creating a beautiful combination. Besides the bottom kitchen cabinets, some open racks are used to store the tableware instead of an upper kitchen cabinet. 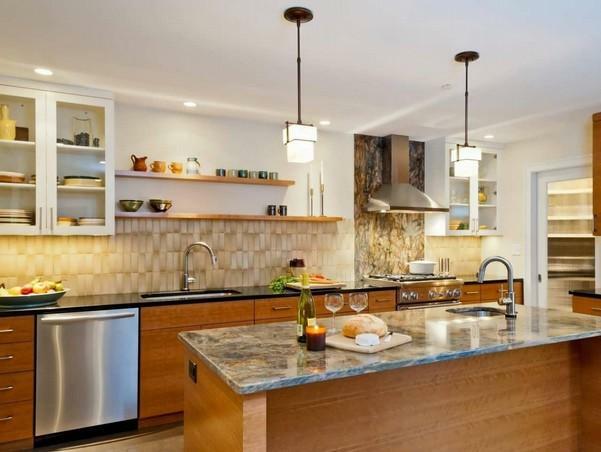 The hanging lamps bring a classy style to this kitchen area. The white color which is dominating this kitchen area combined with the large glass windows makes the spacious area looks even more spacious. The curtains are added to the glass window as a protection if the sunlight is too bright. 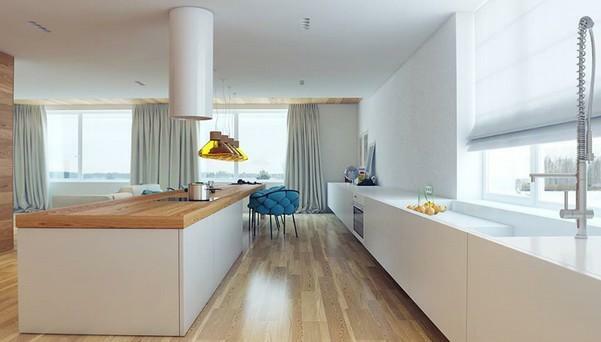 The dominating white color blends perfectly with the wooden countertop and wooden floor. 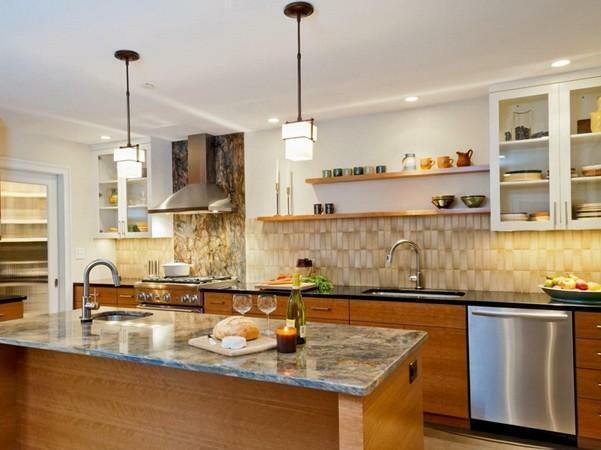 Moreover, the wood material used for the countertop and floor adds a warm touch to this modern kitchen. A unique blue dining chair and unique stainless steel kitchen faucet make it looks more attractive. This kitchen area combines some tones of grey. Such as the light grey tone for the marble countertop, the medium grey tone for the kitchen floor, and the dark grey tone for the ceiling. If you want to use only 1 color for any room in your house, you can follow this idea in order to make the room looks less plain. The middle area of this kitchen is left empty in order to provide a lot of spaces in the kitchen area. As you can see, bottom kitchen cabinets are preferred to be used instead of upper kitchen cabinets. The kitchen in the picture above looks very modern and fancy at the same time. The color combination of black, white, natural wood color create those 2 beautiful styles. The householders differentiate the kitchen table and dining table by using different materials. The wood material is used for the kitchen table that brings a warm touch to the area, while a black solid material is used for the dining table. The bar-look dining chairs complete the modern style and make the area even more stylish. The attractive open racks are used to place some decorations so that this area looks attractive. This kitchen area looks so warm and natural because of the colors used. 2 long open racks are added as an additional storage in order to place the kitchen utensils or tableware. The householders also use the wall-mounted glass kitchen cabinet to save and display the tableware so that the cabinets can also act as the kitchen wall decoration. 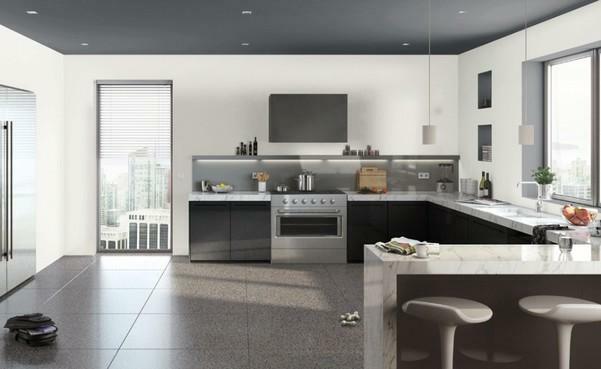 The grey marble countertop is chosen in order to add a modern touch to the area. 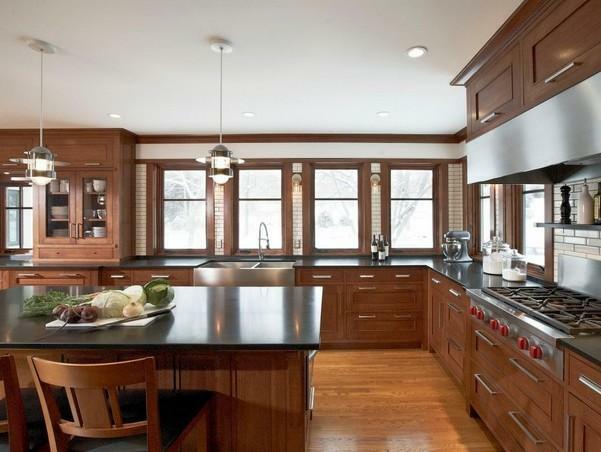 The wood material dominates the kitchen in the image above. From the kitchen cabinets, floor, dining table, and dining chairs, all of them are made from wood. It brings a farmhouse style to this kitchen. 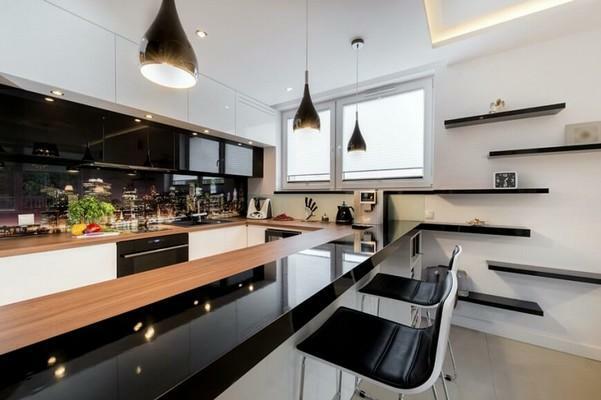 But the countertop and the top part of the dining table is made from a black solid material in order to add colors to this kitchen area so that it does not look plain. Some glass windows are also added so that the natural sunlight can come into the area and make the air circulation well. 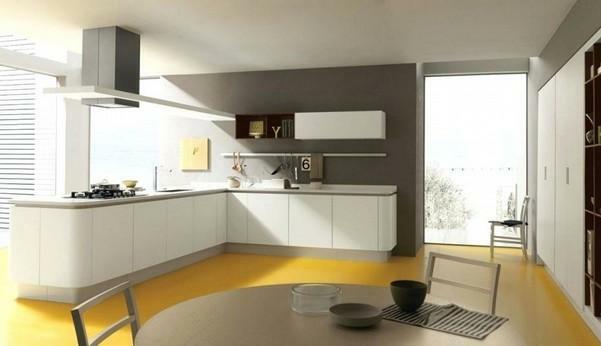 The yellow floor in this kitchen catches an attention to whoever comes to this area. The floor is also able to add a color besides the neutral colors used such as white and grey. The householders choose an L-shaped kitchen which is one of the most used kinds of kitchen. The middle area is left empty so that the householders are able to freely move. For you who want to have a unique kitchen, you can try this idea. 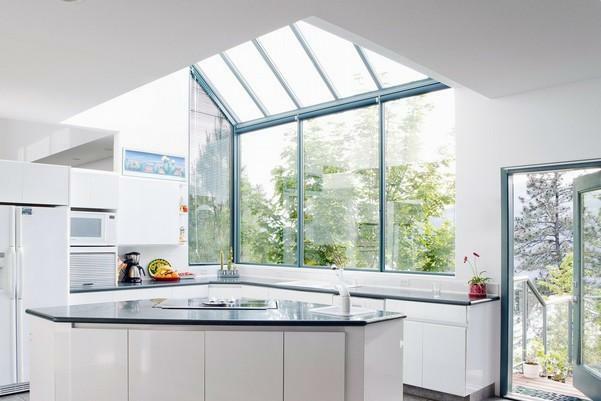 Are you dreaming of having a kitchen that looks like a greenhouse? Then, you can apply this idea to your kitchen. A glass material is used for the windows and ceiling, making this kitchen area has a great air circulation. The glass windows and glass ceiling are not only able to allow the sunlight comes through the area, but they can also allow you to enjoy the pretty outside view while doing your cooking activity. This kind of kitchen is more suitable to be placed in the back part of a house near a backyard. Moreover, the white color matches perfectly with the glass material. It is the look from another side of a warm kitchen in number 5. As you can see, the patterned kitchen walls are installed so that this kitchen area looks more attractive. There are 2 sinks so that the householders can easily wash the dirty dishes from the dining table and the ones from the kitchen table. The hanging lamps add a uniqueness to this kitchen area. Those are the ideas of a modern kitchen without any upper kitchen cabinets that you can try. There are many alternatives that you can use instead of using an upper kitchen cabinet, such as an open rack or bottom kitchen cabinets in order to store your collection of tableware or kitchen tools. Or you are also able to use a hanger to hang up your cooking pots or cooking pans. Even though a glass wall-mounted kitchen cabinet will be a great idea to have a storage and decoration at the same time.